Thomas Dunne Books, 9781250104694, 304pp. A travel narrative that focuses on Sicily's little-known regions, from the author of Seeking Sicily and Hidden Tuscany. From Palermo to Castiglione di Sicilia to Alimena, Sicily holds great secrets from the past and unspoken promises. Tradition, in the form of festivals, the written word, photographs, and song, reverberates through village walls. Now, slowly shaking itself free of the Mafia, Sicily is opening itself up to visitors in ways it never has before. 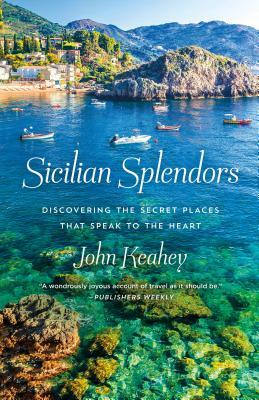 Sicilian Splendors explores the history, politics, food, Mafia, and people which John Keahey encounters throughout his travels during his return to Sicily. Through conversing with natives and immersing himself in culture, Keahey illustrates a brand new Sicily no one has ever talked about before. Villagers, eager to welcome tourism and impart awareness of their cultural background, greet Keahey for meals and drink and walk him through their winding streets. They share stories of well-known writers, such as Maria Messina, who have found inspiration in Sicily’s villages. Keahey’s never-ending curiosity as a traveler shines light on Sicily’s mythical mysteries and portrays the island not only through his eyes but also through Sicily’s heart. This picturesque travel memoir navigates Sicily today and seeks to understand Sicily’s past. In lyrical prose and vivid dialect, Keahey paints images of the island’s villages, people, and culture with careful strokes and a meticulously even hand. Keahey not only serves as a guide through the marvel of Sicily’s identity, but he also looks deeply into Sicily’s soul. JOHN KEAHEY, author of such books as Hidden Tuscany and A Sweet and Glorious Land: Revisiting the Ionian Sea, is a veteran newspaper and wire-service journalist who spent forty-five years in and around journalism. He retired in 2011 after twenty-two years, as a reporter and news editor for The Salt Lake Tribune. He has a history degree from the University of Utah and spends as much time as possible in Italy.